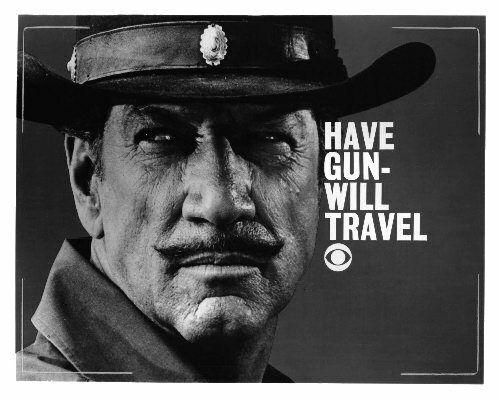 Have Gun, Will Travel, the late ’50s-early ’60s television show starring Richard Boone as Paladin, the dandyish liquored-up wild west badass for hire. Toy stores sold plastic replicas of Paladin’s Colt revolver, and the gun manufacturer itself peddled replicas of the famous wood-handled revolver. 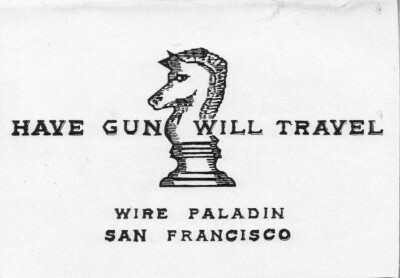 Paladin’s suggestive calling card was part of the opening credits. This was a big show of its time. One episode, called “Bob Wire,” concerned a geeky but snaky barbed wire salesman who got himself in the middle of a war between cattlemen and farmers, and who needed Paladin’s cover. The guest star in this episode was the character actor Woodrow Parfrey, his dialogue written as strange pitter-patter bursts. 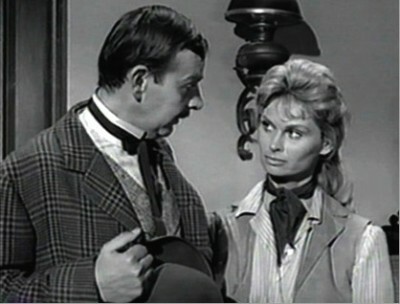 Of course there was the obligatory shoot-out scene, but the underlying gag of the show was that the foxy cattleman’s daughter, played by none other than Irish McCalla of Sheena, Queen of the Jungle fame, falls in love with the barbed-wire salesman geek. That’s right, my dad and Sheena, both together. Now Irish would have been some kind of mommy dearest to me! Some other time I’ll write about Nancy Sinatra playing my father’s daughter in an episode of The Man From UNCLE… That confused me. I guess Nancy was a new sister. But then how should I consider Nancy’s other father, the famous singer? Would Frank then be my father-in-law?